Villa Ida has recently been renovated to a high standard of comfort and self-catering convenience whilst still retaining its traditional Tuscan cottage charm. The house is on 2 floors. The master bedroom, a double bedroom, living room, kitchen with dining area, and bathroom are found on the upper level. The recreation room, which can be converted to an additional bedroom sleeping 2, is on the lower level along with an adjacent bathroom. A washing and utilities room is also located on this level. For relaxation, you can enjoy walks in the woodlands around the property, an outdoor paradise for children in a secure environment. For the more energetic, the area is very popular with Italian cycling enthusiasts, both on and off-road. Or you may simply just want to relax on the terrace or balcony, with a glass of the best local wines and a good book. As everywhere in Italy, there is an abundance of restaurants in the area, offering a variety of local delicacies in a home-style environment. Or sample the superb wines of the Colline Lucchesi estates, on the road to Lucca. All standard amenities are available nearby - supermarkets, banks, post office and tourist information office. As with anywhere away from the main tourist centers in Italy, you will need a car to get around. Although decorated in rustic style with its traditional oven, this tuscan cottage kitchen / dining room is fully equipped with a modern cooker, microwave, refrigerator, and freezer and well stocked with crockery, cutlery and other utensils. 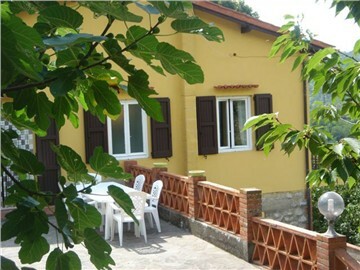 A mahogany dining table in the centre seats six - adequately providing for a self catering in holiday in Tuscany. system. A collection of video cassettes and discs is also available. This is ideally suited as a relaxation room for children, but can be converted to an additional bedroom for 2 people - a large room with a selection of games, TV and a sofa bed. There is an adjacent bathroom. The room is accessed by staircase from the living room but also has a separate entrance to the outside. This room on the lower level has a washing machine and drying area. There is ample parking for 2 cars at the entrance and rear of the house.